Nintendo’s shown big drops in both profit and sales for the period ending June 30, with the company making a loss for the period. Sales were down 25.6 percent for the quarter, dropped to ¥188.6 billion from ¥253.5 billion in the same period last year. Operating income dropped 42.2 percent, down to ¥23.3 billion from ¥40.4 billion in the previous year. The company was actually in loss for the quarter, with net income minus ¥25.2 billion yen compared to a profit of ¥42.3 billion yen last year, a drop of 60.6 percent. Wii software dropped, however, down to 28.17 million copies in the period from 31.07 million last year. That’s a fall of 9.3 percent. DS hardware sold 3.15 million units in the quarter down from 5.7 million in the same period last year, a slide of 44.7 percent. DS software managed 22.42 million sales, down from 29.09 million in Q1 ’09, a decrease of 22.9 percent. Super Mario Galaxy 2 – 4.09 million. Nintendo updated its global release schedules alongside the results. 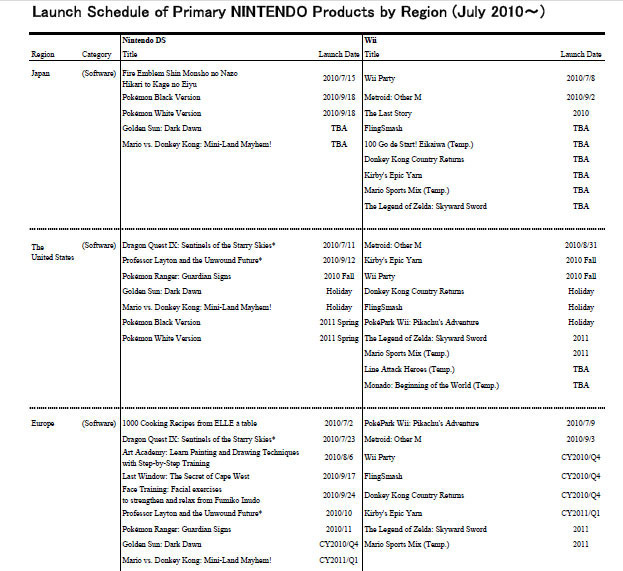 Kirby’s Epic Yarn has now been confirmed for the first calendar quarter of 2011 in Europe, and “fall” in the US. It’s still listed as “TBA” in Japan. Hit the image below for all the new dates by region.